25 Watts (6V6GT power tubes and 5Y3GT rectifier tube). (4) 12AX7, (2) 6L6GC and (1) GZ34. Bass, treble, and midrange controls, BRIGHT switch, and RAW control. 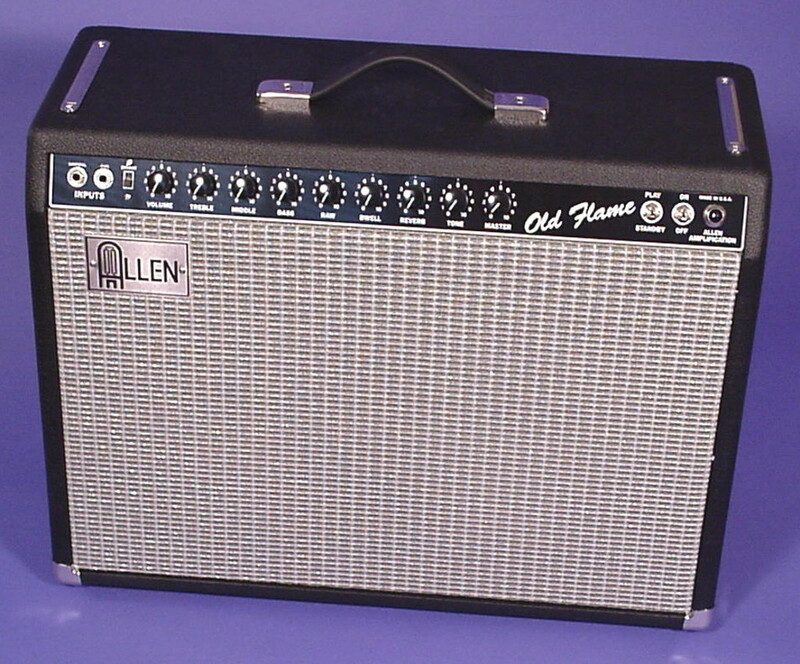 All-tube long 3-spring medium delay tank in a heavy vinyl reverb bag with Dwell, Mix, and Tone controls. Shielded cables. Post-driver using dual potentiometer and (4) coupling capacitors. 18-gage non-magnetic stainless-steel with welded corners. Cool and quiet running Allen TP40 200ma power transformer, TO40MT upgrade paper bobbin interleaved winding output transformer, TR reverb transformer and TRCH choke are all U.S. made. See the TRANSFORMERS page for details. 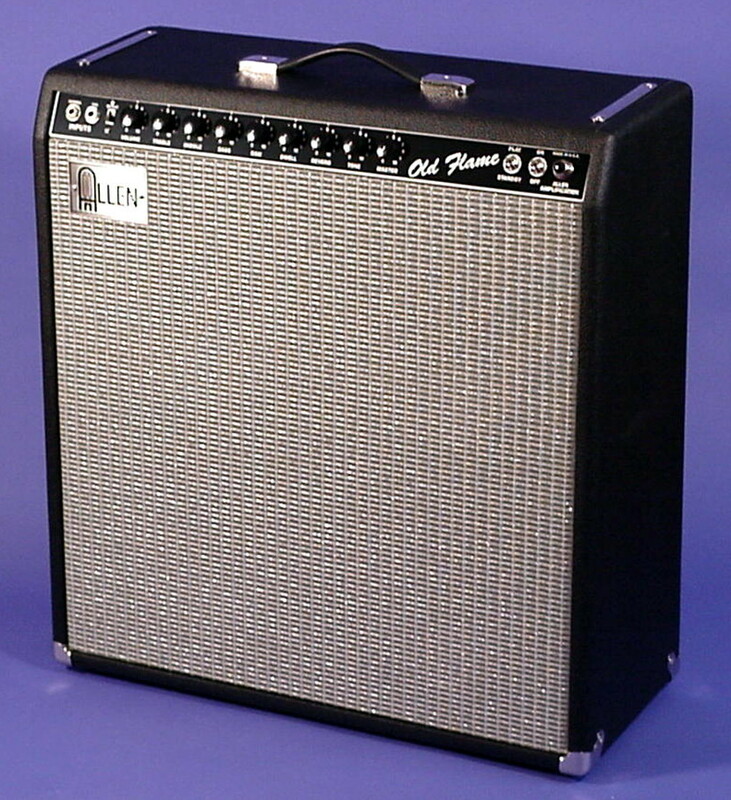 Design is loosely based on the mid 60's Fender Super Reverb but without a normal channel or a vibrato function. Design is enhanced with 3-knob reverb control, master volume control, "RAW" control, front panel power switches, impedence switch, and rear panel bias adjustment jacks. 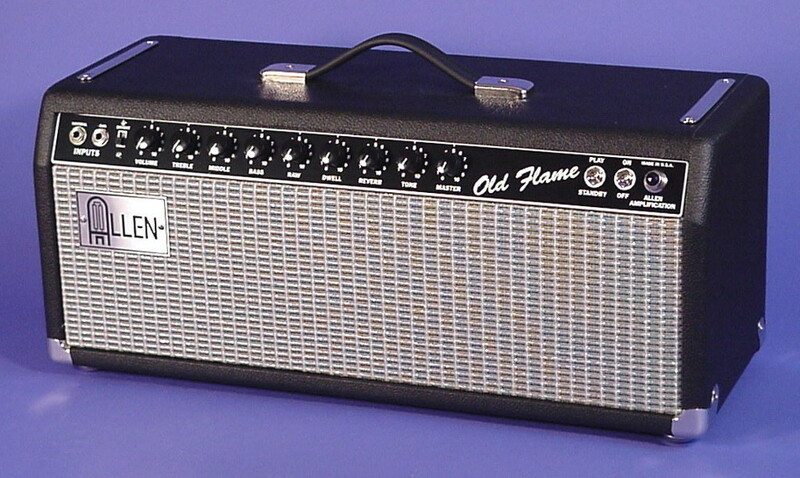 Solid pine with black Tolex covering, black/white/silver sparkle grill, floating plywood baffleboard. (2) Tolex covered, rear screw on panels. Chrome corners, rubber feet, chrome chassis straps, black-rubber (steel-reinforced) carrying handle with chrome caps, chrome screws. Eminence Copperheads in the 2x10, Eminence Red, White and Blues in the 1x12, Eminence Legend 151 in the 1x15. Unique front panel "RAW" control brings up the mids scooped by the tone stack while providing a substantial gain increase. Bias adjustment jacks on rear panel provide quick and easy power tube adjustments with any DC milivolt meter. Check for correct bias and matching. Front panel-mounted Carling toggle-type for AC Power and Standby. 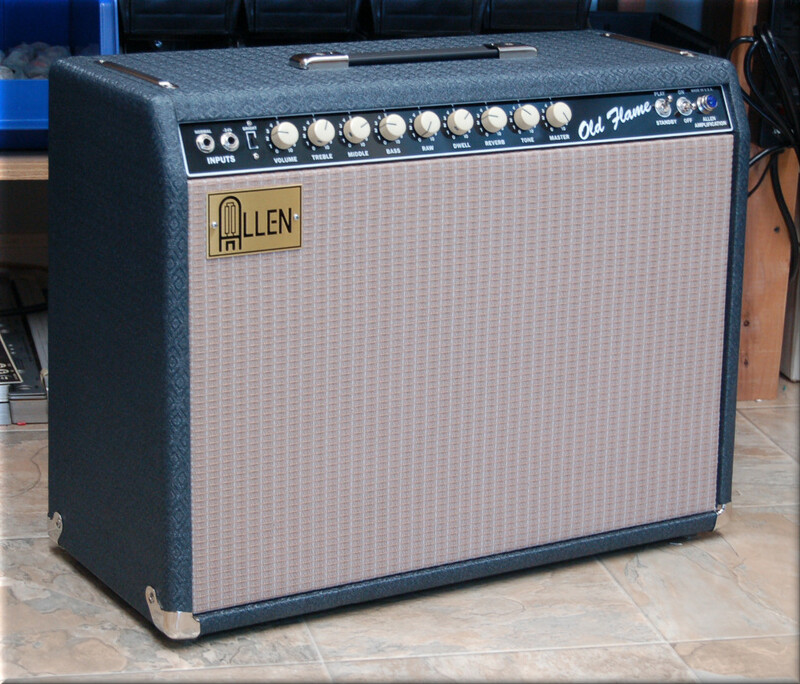 1x12 combo - 24.25"W x 18"H x 9.75"D, 48 lbs. 2x10 Combo - 24.25"W x 18"H x 9.75"D, 52 lbs. 1x15 Combo - 24.25"W x 22"H x 9.75"D, 50 lbs. Head - 24.25"W x 10"H x 9.75"D, 35 lbs.